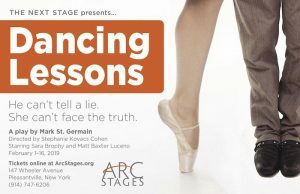 Arc Stages to present Dancing Lessons by Mark St. Germain, beginning February 1. Pleasantville, N.Y. —Pleasantville theater company Arc Stages presents Dancing Lessons to continue their fourth season for their professional company, the Next Stage. This follows the successful run of Forbidden Broadway earlier this year. The Next Stage focuses on showcasing new, innovative work by a wide variety of exciting and talented writers. It is the third wing of a company that also includes a thriving Educational Stage and Community Stage. Performances will be held at Arc Stages, located at 147 Wheeler Avenue in Pleasantville NY. Tickets are $36 for adults, $28 for students/seniors. To purchase tickets, please visit www.arcstages.org or call 914-747-6206. Dancing Lessons will be directed by Stephanie Kovacs Cohen and features Sara Brophy* & Matt Baxter Luceno*. Dancing Lessons centers on Ever, a young professor with Asperger’s syndrome, who seeks the instruction of a dancer to learn enough about dancing to survive an awards dinner. Senga, the dancer, is recovering from an injury that may stop her dancing career permanently. As their relationship unfolds, they’re both caught off-guard by the discoveries—both hilarious and heartwarming—that they make about each other and about themselves. Arc Stages is a multifaceted arts organization in Pleasantville, New York, which is composed of three theatre companies under one roof. The Educational Stage: an educational theatre company where students of all ages (youth and adult) can explore the world of theatre through a professional rehearsal process, master classes, outreach and intensive ensemble work. The Community Stage: a community theatre company for actors, singers and technicians from all walks of life that offers the best in American musicals and dramas. The Next Stage: a professional theatre company that endeavors to produce high quality contemporary theatre as well as new works, cabaret, workshops and staged readings.